Really hoping you can help. I am having problems with opening Raw files captured on my Fuji X-T2 (.RAF). The files are displaying with one segment of the image repeated in another segment of the image; either the top left quarter of the image is repeated in the top right quarter or the full left half of the image is repeated in the right half. I have tried lots of different files with the same result. This is only a recent problem. I am not sure whether I've run any updates that may have caused this issue as I've not used the software for a few weeks. I've attached a screenshot so you can see the issue. As far as I know I'm running the latest version of Affinity Photo. 1.6.7. I am running macOS High Sierra 10.13.4. This is a known issue that's already logged to be looked at. If you change the RAW engine to Serif Labs it should open the image correctly. To do it, click the tuxedo icon in the main toolbar (with the RAW file open) and change the first dropdown (RAW Engine) to Serif Labs. Close and reopen the RAW file again. Thank you very much. All sorted now. 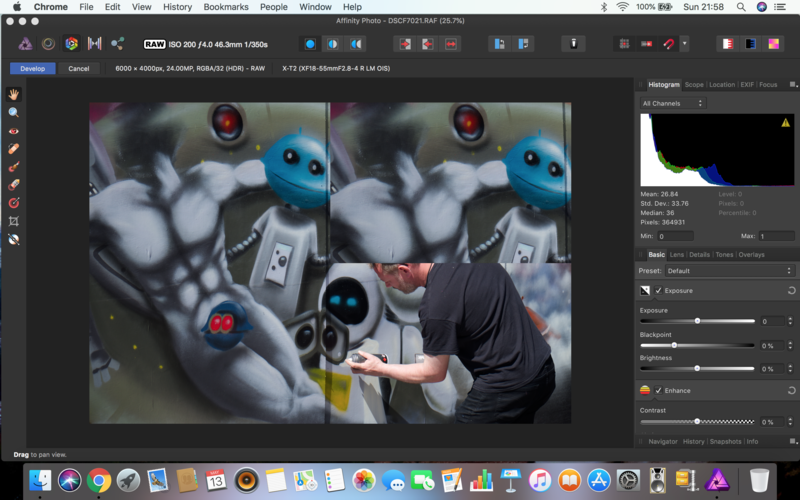 Can you please download the latest Affinity Photo Customer Beta (1.7.0.109) and check if the RAW files now load correctly for you when using the Apple (Core Image RAW) engine? This issue should now be fixed in this build. Let us know if the RAW's still don't load correctly for you. Thanks.